This election takes place as Thomas Jefferson’s second term is winding down. While Jefferson’s first term was wildly popular, his decision to unleash an embargo against Great Britain has crippled Northern industry, upsetting even Northern Republicans. Despite this, Jefferson’s popularity is still high, but he has chosen to retire, rather than seek a 3rd term. As such, Jefferson’s Secretary of State, James Madison, moves to the front rank as Jefferson’s preferred successor. Yet, Madison hasn’t the charisma that Jefferson had and, therefore, seems potentially vulnerable. Therefore, conservative Republicans led by John Randolph, who believe Jefferson and Madison are too moderate, promote James Monroe for the nomination. Meanwhile, Northern Republicans push for George Clinton’s nomination, as they tired and feared a continued Virginia Dynasty. Federalists also sensing an out-side chance of victory, debated on whether to support Clinton’s nomination or to field one of their own candidates. Ultimately, they chose their own candidate. As Federalist leaders couldn’t convince any of their superstar politicians to run, such as Chief Justice John Marshall, they opted to support the same ticket as in 1804, Charles Coatesworth Pinckney and Rufus King. Internationally, the Napoleonic Wars dominate the headlines. After some tension, James Madison was able to wrap up his nomination for president rather convincingly, thanks to the endorsement of Thomas Jefferson and the Nominating Caucus. Madison kept Jefferson’s VP, George Clinton. 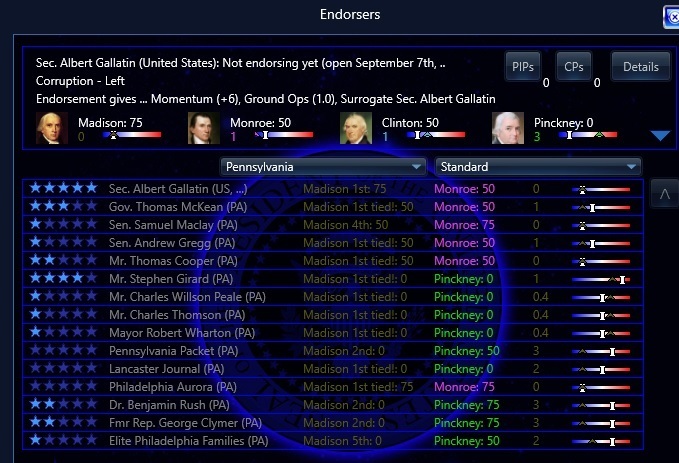 However, groups of Never Madisons supported either VP Clinton or Monroe through election day. 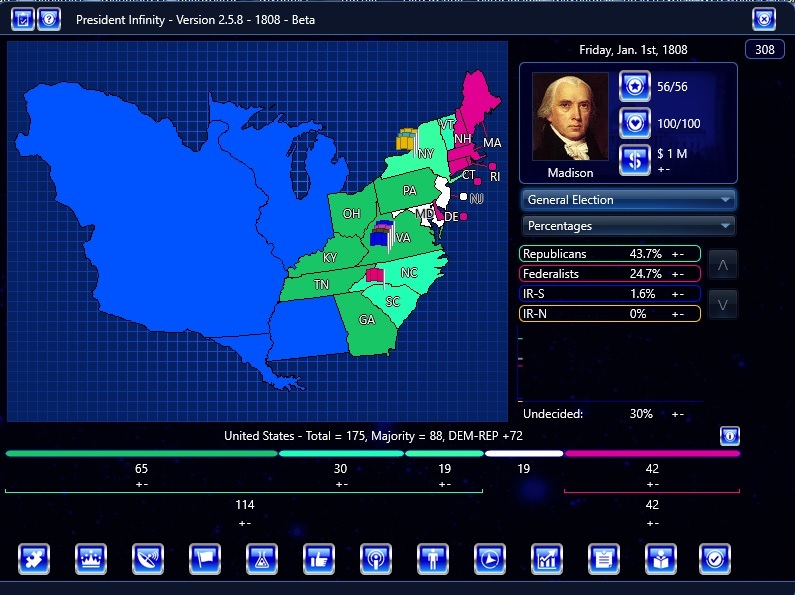 Madison easily defeated Pinckney for the presidency, even taking Vermont. Yet, it could have gone another direction. Clinton supporters made headway in NY, and could have possibly held the state. A stronger Federalist candidate would have captured all of New England, plus Delaware. John Marshall, a popular Southern Federalist, would have likely to Maryland, New Jersey, North Carolina. Pennsylvania might have been a contest. In short, fear of defeat held back a chance of victory in what could have been a more contested election. Why not test your skill by attempting to defeat James Madison with Charles Coatesworth Pinckney? What if George Clinton had taken the nomination for himself and his Northern Republicans? What if James Monroe had won the nomination for himself and his conservative Old Republicans? What if Thomas Jefferson had run for a 3rd term? What if Aaron Burr opted to run, despite crippling scandals? What if Elbridge Gerry, a rare Massachusetts Republican, ran? What if DeWitt Clinton ran a stronger independent Northern Republican insurgency campaign? What if John Randolph personally ran a strong insurgent Old Republican campaign for his conservatives? What if Chief Justice John Marshall had agreed to run as a superstar Federalist candidate? What if former president John Adams sought a non-consecutive second term? What if Alexander Hamilton had not been mortally wounded and ran in 1808? What if John Jay opted to be the Federalist superstar candidate? What if John Quincy Adams, the moderate son of John Adams, ran as a candidate that could potentially win Northern Republicans and Federalists? What if Rufus King were on the top of the ticket, rather than as the VP nominee?